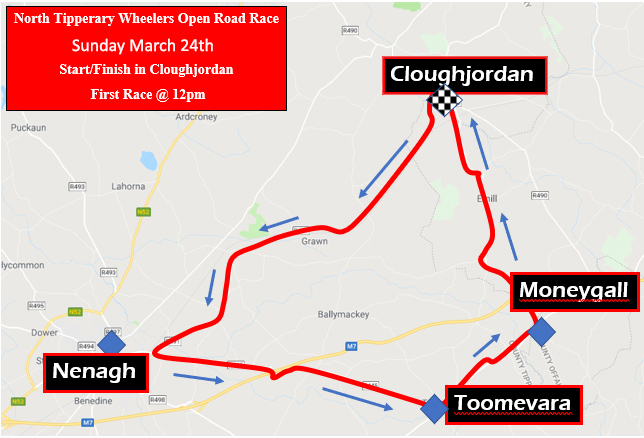 Big time cycle racing returns to North Tipperary this weekend with the second running of the North Tipp Wheelers Open Road race. The inaugural event last year received widespread acclaim for the course, the organization and hospitality afforded the riders who had traveled from all over the country. Race headquarters will be MacDonagh Park, Cloughjordan, a venue which is ideal in terms of access, hosting and parking. The event will see the country’s top cyclists battling it out against each other over the course from Cloughjordan to Nenagh, Toomevara and Moneygall before returning to the start / finish line. There will be three races on the day; the elite A1 and A2 riders will cover three laps, the second grouping involves the A3 and Junior riders who also cover three laps and the A4 cyclists will race two laps. North Tipperary has gained a reputation for hosting major cycling events in recent years from the Rás to the Visit Nenagh Classic and now the Wheelers Open Road race. Riders invariably comment on the welcome and hospitality and we know that the event on Sunday will be no different. The public are invited to come out on the course and show their support. The first race is off at 12 noon.